← Let the Summer Festivals Begin! Thanks for your feedback and tips. So very true. I have posted to your CSA party link. Thanks for including me! If you make extra of different kinds the leftovers are great stir-fried as side dish for another meal! So true and a great tip. Thanks for sharing! What kind of grill do you have?? I want one of those big green eggs but it’s sooo expensive maybe one day. I actually have two grills. I have a Weber charcoal grill and I have a gas grill too. 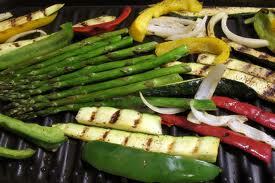 When I have the time, I prefer to use my charcoal grill, it gives better flavor and control. The round shape of the Weber grill provides more even heat distribution as well. The gas grill is convenient for a quick burger and especially in the winter when you don’t want to build a fire in the charcoal grill.